Bad breath is the most common sign of dental disease noted by pet owners. However, this is often only the tip of the iceberg. The gums can become irritated leading to bleeding and oral pain. Bacteria surrounding the roots can also gain access to the bloodstream (“Bacteremia”), causing other medical issues to occur. 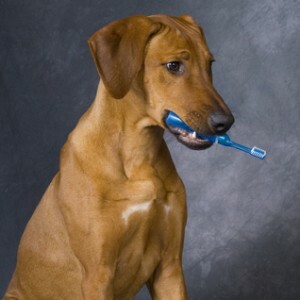 Taking care of your pet’s teeth and gums will contribute to overall good health. Just like people, when a pet’s gums are sore and swollen, it hurts(please understand that pet’s rarely demonstrate pain until it is very severe). Regular exams and dental cleanings with your veterinarian will help prevent pain, tooth loss, infection and bad breath. In addition to professional dental cleanings you can offer treats and toys that encourage chewing action, as well as performing daily brushing your self, to help keep plaque and tartar build up at a minimum. Now that we have gotten your attention about dental health let us explain exactly how we perform your pets dental cleaning. Some of the procedures are the same as our own cleanings, however, due to your pet’s inability to communicate with us we must perform their cleaning while they are under general anesthesia. Therefore a few additional procedures are required to assure your pet’s comfort and safety while in our care. Once your pet is admitted to the clinic the first procedure we perform is a blood test to determine that your pet is healthy and may receive anesthesia. When this is completed an iv catheter is placed so that we may administer fluids to keep them hydrated during the dental cleaning. An oral exam is now performed by the veterinarian, examining the teeth for looseness, fractures, malocclusion, and periodontal disease in addition a full set of dental radiographs is also taken at this time. The veterinarian will then determine a plan of treatment if needed and contact you to discuss any additional findings and necessary treatment. Plaque and tartar are now removed using dental forceps and ultrasonic scaling equipment. All surfaces of the teeth are cleaned including above and below the gum lines. If any further procedures were needed the veterinarian will perform those now also. The next step is polishing that smoothes out the microscopic defects and removes any plaque missed during the previous steps. Once all of this is completed your pet’s mouth is then rinsed well and he is taken off of anesthesia at this time. We will continue to monitor your pet for a couple of hours before they go home. Now your pet is ready to give you fresh and clean kisses!